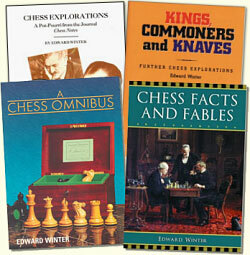 2/14/2007 – Since Chess Notes began, over 25 years ago, hundreds of mysteries and puzzles have been discussed, with many of them being settled satisfactorily, often thanks to readers. Some matters, though, have remained stubbornly unsolvable – at least so far – and a selection of these is presented here. Readers are invited to join in the hunt for clues. 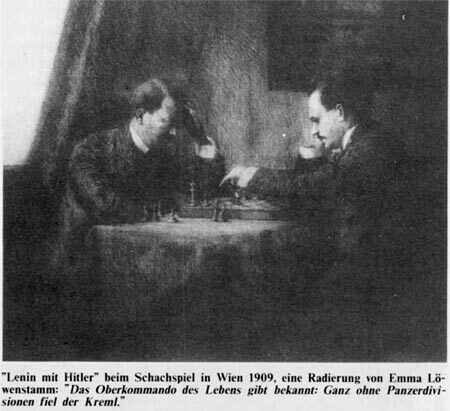 The reference to worldwide distribution suggests that the photograph of Fischer and Karpov should be commonplace, but who knows where it has been published? 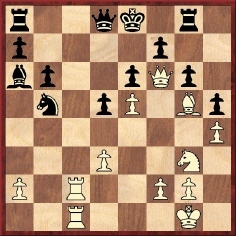 Shortly after David Bronstein’s death in 2006 Pierre Bourget (Canada) mentioned the game D. Bronstein v B. Goldenov, Kiev, 1944, which is given in various databases as follows: 1 e4 e6 2 d4 d5 3 Nc3 Nf6 4 Bg5 Bb4 5 e5 h6 6 Bd2 Bxc3 7 bxc3 Ne4 8 Qg4 g6 9 Bc1 c5 10 Bd3 cxd4 11 Ne2 Nc5 12 cxd4 Nxd3+ 13 cxd3 b6 14 h4 h5 15 Qf3 Nc6 16 Bg5 Ne7 17 O-O Ba6 18 Rac1 Qd7 19 Qf6 Rg8 20 Rc3 Nf5 21 Ng3 Nxd4 22 Rfc1 Nb5 23 R3c2 Qd8 24 Qf4 Qd7 25 a4 Resigns. The Treasury gave the move three exclamation marks, but what is the truth about the conclusion to the game? 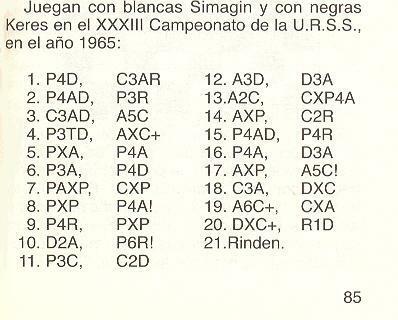 The above victory by Keres in the 1965 USSR Championship was, in fact, against Kuzmin, not Simagin. 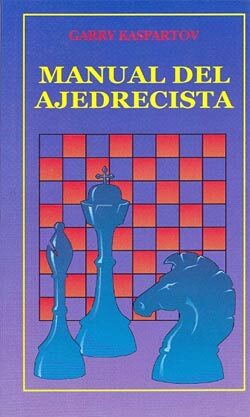 Is that perhaps a helpful clue as to the provenance of the Spanish volume? Have any other books made the same factual mistake?